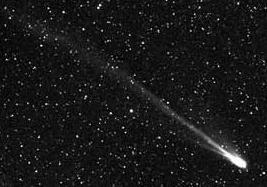 Comet Swift-Tuttle is a short-period comet and the parent body of the Perseids meteor shower. It was discovered on July 16, 1862, by Lewis Swift (from Marathon, New York), and, independently, on July 19, 1862, by Horace Parnell Tuttle (from Harvard University); however, it is now known to be the same as Comet Kegler of 1737 and appearances have been identified as far back as 69 BC. Last seen in 1992, Swift-Tuttle will be in our vicinity again in 2126.